"I want to drink protein powder"
"need to eat more protein"
"this meal don't even have protein at all!" Everyone is talking about protein protein protein, but does anyone know what is protein and why does one need it? 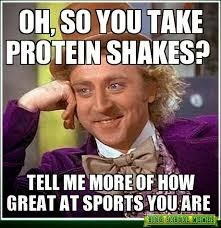 And sometimes it drives me crazyyy how people get so insane about protein shake like dude chill, it is just protein. 1.You only drink protein when you want to bulk. 2.Only certain specific foods have protein. Disclaimer: This is based on many researches that I have found and things that i have learnt hence I will not be responsible for any inaccurate information. It is a component of every cell in your body. In fact, hair and nails are mostly made of protein. Your body uses it to build and repair tissue. You need it to make enzymes, hormones, and other body chemicals. It is an important building block of bones, muscles, cartilage, skin, and blood. Unlike carbohydrates and fat, your body does not store protein, so it has no reservoir to draw from when you’re running low. HOW MUCH PROTEIN DO WE NEED PER DAY? For 18 years old and above, you are encouraged to get 10% to 35% of your day's calories from protein foods. 0.8g of protein for each kg you weigh. It isn't hard to get as a small 3-ounce piece of meat has about 21 grams of protein. A typical 8-ounce piece of meat could have over 50 grams of protein. One cup of dry beans has about 16 grams of protein. The answer is yes you will. Reason being, one serving of protein shake has only a few calories. For myself, i consume Lean protein shake which is 100 calories for one serving. I usually have 6 meals a day hence i will drink it as my post workout snack. As it contains less calories and can make you feel full and have protein and some nutrients, it will make you lose weight if you do not binge on many other foods throughout the day. 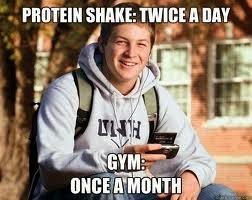 However with that being said, what can a bottle of protein shake provide you? So here is my suggestion: to only drink one meal replacement shake a day, taking into account that your other meals are to contain the sufficient nutritional values. HAVING MORE PROTEIN IN YOUR DIET HELPS TO LOSE WEIGHT? In a way, Yes. If you eat 100 calories of protein, your body will burn about 20 to 30 of those calories while processing the protein, says Wycherley. Compare that to 100 calories of carbs, and your body only burns about 5 to 10 calories. Another reason for the weight loss may be because protein helps preserve muscle mass. And since muscle mass burns more calories than other types of mass, the additional calorie burn could result in a decrease in weight. it contains around 1270 per 2 servings,261g of carbohydrates(for info, a bowl of rice only have only 45g of carbohydrates), the mass building power of this mega-dosed formula lies in its calorie-dense macronutrient profile and its ability to elevate insulin (an important hormone) and drive more nutrients into your muscles.However do note that it may cause your blood pressure to drop.Taking large amounts of weight gainer products for long periods can adversely affect your body and cause kidney damage. Weight gainers containing creatine can cause liver dysfunction and kidney damage. It depends on whether are you weight lifting enough. How do muscles grow bigger? It is when you train hard and damage your muscle, and protein which contains lots of amino acids help you to repair the muscles and make the tissue bigger. 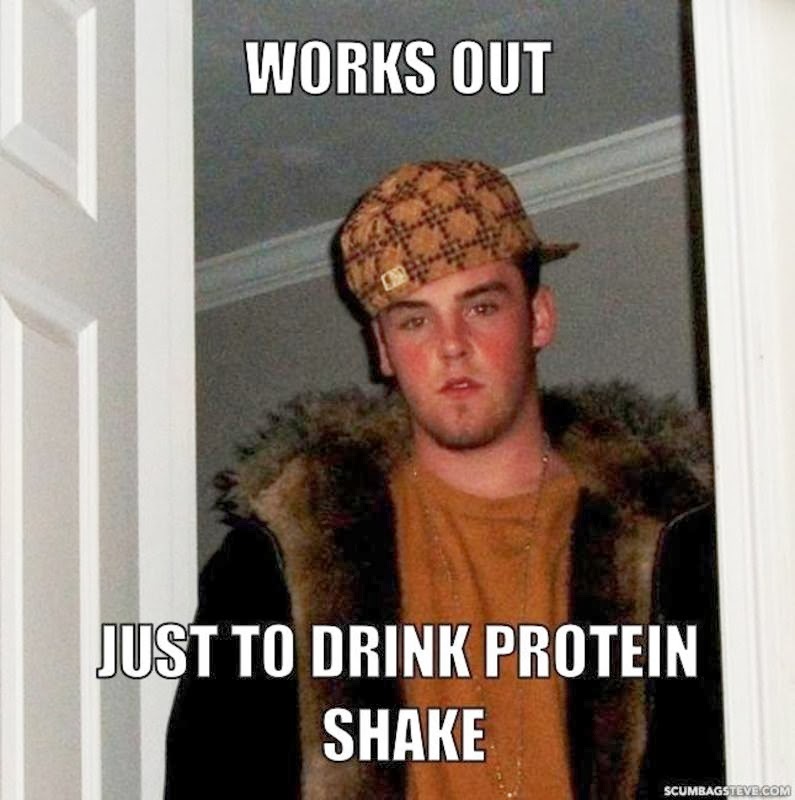 please don't be like this..
Whey protein- derived from milk and it also enhances the immune system. Whey isolate: virtually fat-free for those wishing to eliminate as much fat from their diet as possible. It is typically lactose free for those few individuals who are very sensitive to the low-lactose levels found in whey concentrate. Whey isolate tends to taste slightly better than whey concentrate too, yet its consistency is a little thinner, without the fat. Whey Concentrate: has a low lactose level that is well tolerated by most lactose-sensitive people. It has trivial amounts of fat and carbs relative to your overall nutrient intake. Whey concentrate is typically the best-selling category of whey. Casein Protein-it is also derived from milk,being absorped by the digestive system slow and steadily, which is good if you want the protein shake to be your meal replacement. IS THERE SUCH THING AS CONSUMING TOO MUCH PROTEIN? YESS. Eating more protein than you should will put you at risk for reduced kidney function and contribute to severe liver problems, When they can't function well, it will contribute to more toxic in the body, and ultimately more sickness. Excess calories from excess protein may be stored as body fat/ Too much protein is also extremely acidic and has an aging effect on the body! Too much protein has been linked to constipation, diarrhea or excessive gas. so do not consume too much protein! Hope this post is helpful to you guys. 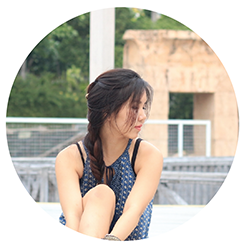 Do tell me if you would like me to write more about these stuffs!